I made it very simple so she can add her own pictures, memorabilia, and embellishments. That's the beauty of the Simply Scrappin' Kits - everything matches, all the card stock stickers are die cut and ready to use. It is SO easy! This past weekend I took my new recruit (Holly!) and my best customer (Tricia!) to a Stampin' University put on by my upline (Penny!). It was a blast - we got to learn 18 different techniques and do a make-and-take. I can hardly wait to try some of the new techniques and maybe do a tutorial on here. Ready for a sneek peek? Okay, you have to pace yourself! I'll post the new colors this weekend, but they are in the back of the brochure so you can check them out. I LOVE the new punch box! As soon as I saw it all the possibilities started popping in my head. There are going to be some cute scrapbook pages lined with flowers soon!! All my customers and anyone on my mailing list is going to receive their own copy of the brochure. Would you like to get one, too? Just shoot me a quick email with "Preview Brochure" in the subject line and I'll send you one when they are out. 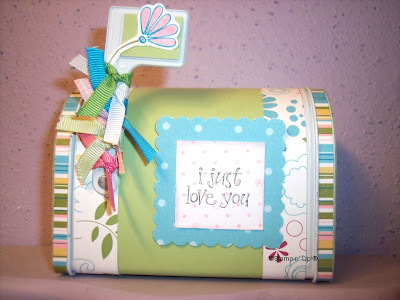 Have a great day, and stamp a little something for someone sweet! I had never used SU! glitter before, so when I placed an order a few weeks ago and had some extra "free product" money to spend I decided to get some Dazzling Diamonds, since I hear about it all the time. Oh. My. Gosh! WHY didn't any of my stamping friends tell me about this stuff years ago? It is so easy to use and produces absolutely gorgeous results! 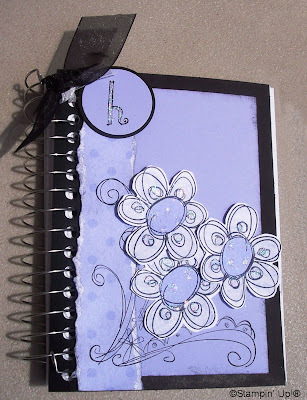 You can use it with a 2-way glue pen (like I did in the project below), Liquid Glue, or with Heat & Stick Powder (which I also bought, but haven't tried yet). Pictures do not do it justice, but I'm going to try to show you. 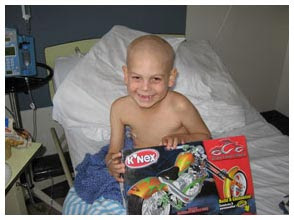 There are only 13 days left to get your cards out to Shane to celebrate his birth and life! Please send a card or two his way. When I found out this set was retiring, I just had to get it! Swell News has some really cute stamps, and I got to use it right away. My cousin is expecting her first baby this fall, and I'm so excited for her! 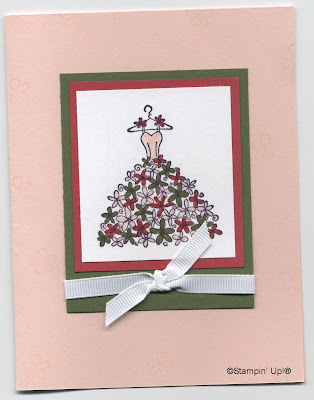 I used some of the new Designer Paper from the Fall-Winter Collection Catalog to do the paper piecing on this card. I don't think she reads this blog, so it will be a surprise. I hope she likes it! I ordered one of the 6x6 pads of new Designer Paper and when it arrived I got straight to work on a card. I just love the colors and patterns. I've always liked experimenting with monotone techniques - and this makes it easy! I'll try color combos next! The little file folder tag pulls out:I used the sanding block to do all the distressing, but I think the next toy I'm going to get is the Cutter Kit. It has a nifty little distressing tool that I've never used before but would like to try out. Does anyone have it? Do you like it? I got another RAK today! I sent my first one out today, too. I'll post a pic later this week. 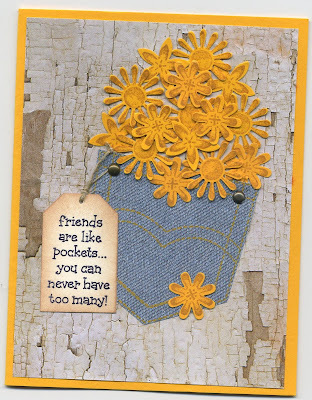 The one I received today is from Denise (Annees on SCS). 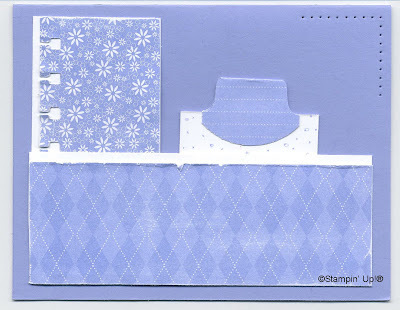 I just recently got this stamp set, so it gives me an idea of how to use it in a simple but elegant way. 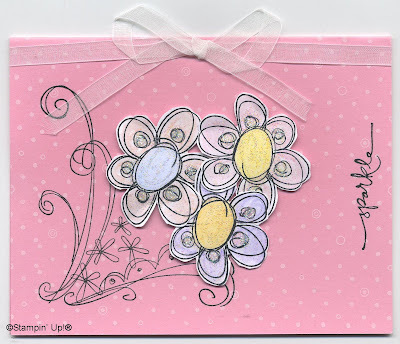 If you like this card, now is the time to order the stamp set she used to make it. Pocket Fun is on the retiring list, so after June it will be gone! Use the links on the left to check out what other stamps sets are going away in just a few weeks. April Showers really did lead us to May Flowers...and stripes, paisleys, swirls, dots, and more! You are going to love May's promotion - Palette o' Prints: 4 colors, 12 patterns, 48 6x6 sheets of fun! Just look at how beautiful this Designer Series Paper from the NEW Fall-Winter Collection 2007 catalog is. And that is just a small sample. There are TWELVE patterns in these four gorgeous colors. Right now is the only time you can order them before the new catalog is released in July. So, pick these May Flowers up before the month is over and you have to wait to see them again. And we all know how dreadful waiting is! Email me to set up your May workshop or to place an order.